Pat Roberts is a fourth generation Kansan, He was born in Topeka, graduated from Holton High School and went on to earn his journalism degree from K-State. He is currently serving his fourth term. 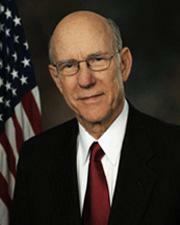 Senator Roberts is Chairman of the Senate Agriculture Committee. He becomes the first member of Congress in history to have chaired both the House Agriculture Committee and the Senate committee. With a record number of votes in favor of his bipartisan 2018 Farm Bill, Senator Roberts also becomes the first member of Congress to write and pass a Farm Bill in both chambers. After devoting a lifetime to public service, U.S. Senator Pat Roberts announced January 4th, he will not seek re-election to the U.S. Senate in 2020 and will retire at the end of this term and the 116th Congress. Seating is limited. Please RSVP at jcrp@jcrpks.org. or call 913.341.8683. Pre-pays will have priority over RSVPs. We will be serving Ya’Ya’s roasted chicken with crispy yukon gold potatoes. This comes with a side of bread & baba ganoush, dessert, and your choice of drink. The cost is $25.00 for members and $35.00 for non-members. Elephant Club memberships are $100.00 annually and includes your first lunch for free. If you would like to become an Elephant Club Member, renew your membership, or pay online for the Elephant Club Luncheon, go to the JCRP website and look for the Elephant Club Luncheon link on the right hand side of the page. Hope to see you there!